Adapting a Winning Sports Team Mentality and transforming it into a motivational business experience. There is no simple or easy way to effective organisational change. This can be seen in the sports world when you do not put in the time and focus, the results will not materialize. Research shows that about 70% of corporate change programmes fail. The cost of failed change programmes hits the bottom line and drains staff morale. In our fast-paced world, where change is happening all the time, the highlighted attributes of a Winning Sports Team Mentality are characterised by adaptability, focus and perseverance and will enhance team performance of any team in a change situation. Matrix Consulting focuses on Organizational, Relationship, System and Team coaching and incorporates the Winning Sports Team Mentality into the business sector. Matrix understands the impact of poorly functioning teams and their inability to adapt to change. Matrix combines techniques from highly successful sport teams and implements tools from high performing businesses that will improve your team’s efficiency, performance and motivation thus effect positively the bottom line. In order for teams to seamlessly move through change, people need to be at the forefront of change management programmes and when this does not occur, programmes will fail dramatically. Teams function through individuals. They are only successful if they have the same focus and work together to towards the same goal. Cohesion is key, individuals normally cannot win the game alone. As successful sports professionals and business leaders, we help you look at different angles and adopt different perspectives when managing change – and in particular we assist you in developing your game to lead your teams and empower your people through this process. We help you to understand the X’s and O’s behind running your business, ie business structure, roles and responsibilities for your people and how to adapt and react to external forces. Your People are very savvy and know when they need to dig deep to perform. Give them a voice and the space so they can finish the game with focus and power. We help you in listening and hearing your team’s voices in order to adapt to your business needs. We show you how to raise your game in terms of team leadership, drive and motivation by developing Winning Sports Team Mentality business strategies, intelligent team/people strategies and change management skills. This gives you that edge in a competing world when managing complex organisational change and successfully delivering on your future strategic goals and vision. We partner with you in the pre-season development, in-season performance and end of season final assessment and preparation for the next year. 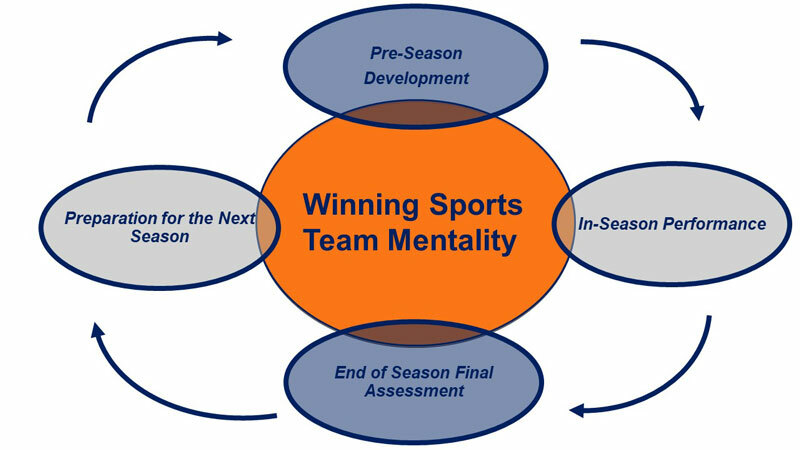 Let us help you achieve your goals and create a Winning Sport Team Mentality in your organization.